London’s Congress Conference Centre is currently the only known conference and events venue in the capital to embrace the principles of leading chefs Jamie Oliver and Hugh Fearnley-Whittingstall in their campaigns to put an end to needless food waste and promote ‘wonky veg’. The environmental and financial impact of food waste came to the fore on the TV series, Hugh’s War on Waste, which blamed supermarkets for much of the food wasted in this country, while the concept of selling wonky vegetables was championed by Jamie Oliver and farmer, Jimmy Doherty, in their programme Jamie and Jimmy’s Friday Night Feast on Channel 4. A keen supporter of the London Living Wage, Congress Conference Centre is also proud to support any initiative to reduce food waste. 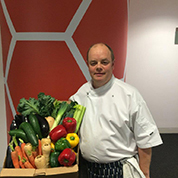 According to the venue’s in-house Head Chef, Damon Shorland(pictured), “Not only does purchasing wonky veg reduce needless waste, but with food costs ever increasing, it helps to keep Congress Conference Centre’s budget on an even keel, which means that we can continue to offer some of the most competitive day delegate rates in central London without cutting any corners when it comes to the quality of our offering.